Loving County is a county in the U.S. state of Texas. As of the 2010 census, the population was 82, making it the least populous county in the United States. Owing partly to its small and dispersed population, it also has the highest median per capita and household income of any county in Texas. Loving County has no incorporated communities; its county seat and only town is Mentone. Part of the Haley Ranch, founded by the father of Texas historian J. Evetts Haley, is in Loving County, with another portion in neighboring Winkler County. Prehistorically, the area had many springs with potable water that supported wildlife and nomadic hunters. Antonio de Espejo visited the area in 1583 and crossed the Pecos River. Having surveyed the area in 1854 for a railroad company, John Pope returned in 1855 to start a camp in northwestern Loving County and established artesian wells in the area, but the venture was unsuccessful and was abandoned in 1861. 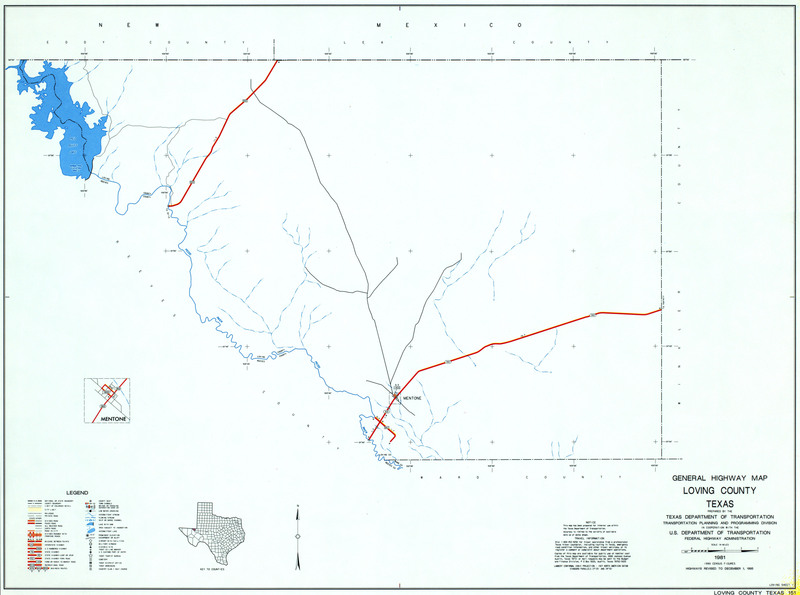 From 1837 to 1874, the area of modern Loving County was part of the Bexar land district. In 1874, it was separated from Bexar County, becoming a part of Tom Green County. Loving County is named for Oliver Loving, a cattle rancher and pioneer of the cattle drive. He was wounded by the Comanches while on a cattle drive in 1867 in the vicinity of the County. Loving is the only county in Texas to be incorporated twice, first in 1887 and again in 1931. Its initial organization was affected by a canal company founded in Denver, Colorado, and appears to have been based upon fraud and willful misrepresentations made by the founders to state officials. After a local landowner hired a New York firm to investigate alleged improprieties in county government, the company's organizers fled, taking with them all the county records. The state legislature subsequently disincorporated Loving in 1897, attaching it to Reeves County. Oil was discovered in 1921, leading to a population increase in Loving County. By 1930, there were 195 residents, mostly living in what would become the town of Mentone, which became the county seat when Loving was reconstituted in 1931. By 1933, the population had peaked at 600, only to begin a steady decline which continues to the present day. Loving County was the home of the first elected female sheriff in Texas, Edna Reed Clayton Dewees. Dewees was appointed to the job in January 1945, then won an election to continue in the office through 1947. She never carried a firearm, and reported only two arrests during her entire term. Later she would return as a county district clerk, a job she held from 1965 to 1986. After retirement she lived on a ranch near Mentone until January 22, 2009 when she died in Del Rio, Texas.